I was privileged to participate in a design charrette which was held at the YouthBuild Philadelphia Charter School on Broad Street in Philadelphia. 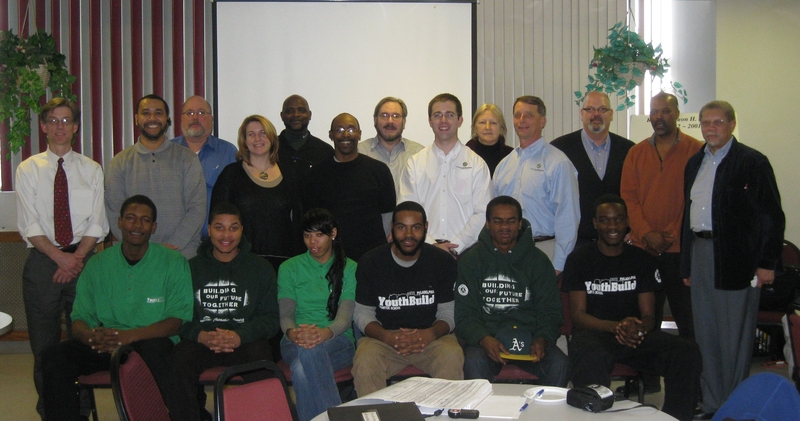 The charrette was conducted as part of the partnership between Saint-Gobain, CertainTeed and YouthBuild USA. The partnership aims to help low-income, disconnected young adults transform their lives and their communities by working towards their high school diploma or GED while learning green construction and job training skills. The Philadelphia project is a renovation of an abandoned row house in the Germantown area of Philadelphia as a hands-on learning in sustainable design and construction for the students. The project will be seeking Leadership in Energy and Environmental Design for Homes (LEED H) certification. The concept of a charrette is from the French meaning cart. In the 1800’s, architecture students created most of their models at home. When their models were due to be reviewed by their professors, the school would send a cart around Paris to pick up their work. Because they were rarely finished with the models or drawings by the time the cart came by, the students would often get on the cart to finish their work while it wound its way back to school. As a result, collaborations between the students started to happen regarding the various design projects. The collaborations, charrettes, continued, expanded and are currently used when discussing design projects by groups of interested parties. While I have participated in charrettes working with architecture firms I have never participated in a LEED charrette. This is a field function of LEED and it is a very comprehensive analysis of the project. The YouthBuild students were able to participate in something that most builders have not experienced unless they are building LEED H homes. The key stakeholders in the renovation include a representative from the Philadelphia Mayor’s Office of Sustainability, college professors, city officials, sustainability experts, architects, renovation specialists, developers and, of course ,YouthBuild students. The charrette was led by Sustainable Solutions, a Philadelphia area company dedicated to sustainable construction. This was an incredible opportunity for the students to see a LEED design charrette in action and have hands-on knowledge which will help them immeasurably when seeking employment. By walking through many of the sustainable aspects of the project – the site review and preparation, architectural/structural issues, the envelope, materials and systems and finishes/appliances in one continuous process the YouthBuild students saw firsthand how everything on the project is interrelated. Each step in the process is critical to satisfy all the requirements for LEED H. This will keep all the stakeholders moving in the same direction. Of course, the charrette ended with “next step’ assignments for all of us. Lucas what a nice story! Thank you for sharing with the world a glipse into this important event. Saint-Gobain, CertainTeed, Sustainable Solutions, YouthBuild Philadelphia Charter School and YouthBuild USA make a great team! So happy to share a cart with you all….